Verbs are a powerful part of your resume. After all, they are what bring action and emphasis to your statements and help you to better convey your potential. Boring verbs can bring down the energy of your resume. And while it seems like verb tense is fairly common sense, this is actually something that trips up many job seekers, especially when it comes to their current job. The past is in the past. This should go without saying. Any jobs you have held previously and do not hold anymore should be written in past tense. The projects and accomplishments are over (or at least your role in them), so it doesn’t make sense to talk about them in the present tense as if they were still going on. 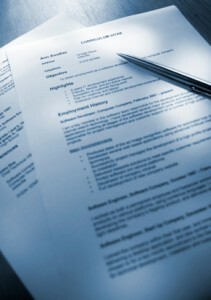 As you update your resume in the future, make sure you go back and revise your previous position so it is in past tense. But is the present always present tense? Not necessarily. Many people are diligent about consistency – which is a good thing – but this can lead to confusion with their current role. Their first instinct is to put everything in present tense because it’s what they’re doing now. But what about projects you have already completed? It makes no sense to have a bullet point that says you saved the company $100k by switching vendors or moving operations in-house and try to put it in the present tense. It just doesn’t work. In these cases, it is fine to have some bullet points in the past tense. This shows what you have accomplished during your tenure thus far. Those bullet points that are in present tense show what you are still working on and activities that are on-going. Recruiters and hiring managers understand that there are bound to be projects that are over or responsibilities you have moved beyond. Some tasks are short-term or special events. Don’t think that you have to come up with a way to creatively wordsmith every bullet to make it present tense. Start each sentence with a powerful action verb. Readers naturally move from left to right, so this is where it will catch their eye instead of buried later on in the sentence. Avoid repetition. When you start multiple bullet points with the same verb, it can get boring and redundant. Mix it up to keep things interesting. If you’re having trouble coming up with different words, use a thesaurus. Consider what each verb conveys. Verbs like spearheaded, implemented, directed, orchestrated, and managed show leadership and initiative. Assisted, helped, supported, and contributed show more of a follower role. This is not to say that you should lie about the part you played to make it sound better, but think carefully about the words you choose and the image they create.